Family Violence isn't just a hot topic across all media at the moment - it's a complex part of daily life for many women and their children who need support from organisations like McAuley Community Services for Women. Can you be part of breaking the cycle of violence and help them to escape and heal? Jocelyn Bignold, CEO of McAuley, wants you to know that you can provide important life changing support to the 600 women and children who McAuley expect to help this year through their refuges, crisis accommodation and the very real, practical specialist programs that give women their independence away from harm. The greater community has been known to ask, "Why don't they just leave?" Rather than understanding the complexity of her situation, there is frequently frustration aired when a woman has paid with her life for not doing so. They can leave when there is somewhere secure to go. Seven days a week, 24 hours a day, McAuley Community Support Services for Women is the "somewhere". 2. Invite friends, family and colleagues to your event. 3.Return funds raised to McAuley Community Services for Women. An average of two women a week have died this year because of family violence. Spread awareness as you raise a cup to thank and support McAuley Community Services for Women. 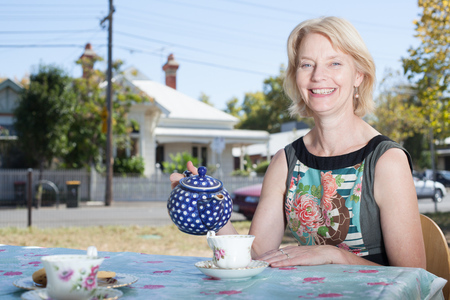 Photograph: Jocelyn Bignold, CEO of McAuley Community Services for Women, asks you to host a high tea to help Victorian women escape family violence. Why? Because in the past year alone there are more than 80 women who will not be celebrating Mother's Day this year.